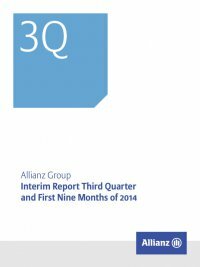 Interim Report Third Quarter and First Nine Months of 2014 Allianz Group70 Reportable segments – Life/Health Reportable segments – Life/Health € mn German Speaking Countries Western & Southern Europe three months ended 30 September 2014 2013 2014 2013 Statutory premiums1 5,396 5,225 5,407 4,149 Ceded premiums written (54) (39) (144) (193) Change in unearned premiums (54) (47) (18) (2) Statutory premiums (net) 5,289 5,139 5,245 3,955 Deposits from insurance and investment contracts (1,767) (1,534) (4,098) (2,790) Premiums earned (net) 3,522 3,605 1,148 1,165 Interest and similar income 2,188 2,203 960 939 Operating income from financial assets and liabilities carried at fair value through income (net) 43 (371) 9 31 Operating realized gains/losses (net) 627 366 114 151 Fee and commission income 23 11 139 115 Other income 29 26 3 5 Operating revenues 6,432 5,841 2,373 2,406 Claims and insurance benefits incurred (net) (3,394) (3,050) (978) (949) Change in reserves for insurance and investment contracts (net) (2,014) (1,916) (578) (719) Interest expenses (23) (24) (6) (1) Operating impairments of investments (net) (59) (25) (39) (10) Investment expenses (145) (131) (53) (50) Acquisition and administrative expenses (net) (449) (408) (423) (432) Fee and commission expenses (9) (5) (71) (51) Operating amortization of intangible assets (5) – – – Restructuring charges – – – – Other expenses (26) (22) (4) (4) Operating expenses (6,125) (5,581) (2,154) (2,217) Operating profit 307 260 219 188 Non-operating income from financial assets and liabilities carried at fair value through income (net) – – – (3) Non-operating realized gains/losses (net) – – 15 – Non-operating impairments of investments (net) – – (4) (3) Non-operating amortization of intangible assets (1) – (3) (3) Non-operating items (1) – 7 (8) Income before income taxes 307 260 226 180 Income taxes (95) (90) (80) (46) Net income 212 170 146 134 Net income attributable to: Non-controlling interests – – 6 9 Shareholders 212 170 140 125 Margin on reserves2 in basis points 50 47 56 54 1 Statutory premiums are gross premiums written from sales of life and health insurance policies, as well as gross receipts from sales of unit-linked and other investment-oriented products, in accordance with the statutory accounting practices applicable in the insurer’s home jurisdiction. 2 Represents annualized operating profit divided by the average of the current quarter-end and previous quarter-end net reserves, where net reserves equal reserves for loss and loss adjustment expenses, reserves for insurance and investment contracts and financial liabilities for unit-linked contracts less reinsurance assets. 3 Presentation not meaningful.